Forgiveness is for people who never walked in your shoes. The bible demands that YOU MUST forgive, absolutely, regardless of the situations involved, regardless of the individual make-up of the person wounded. "Do not judge, and you will not be judged. Do not condemn, and you will not be condemned. 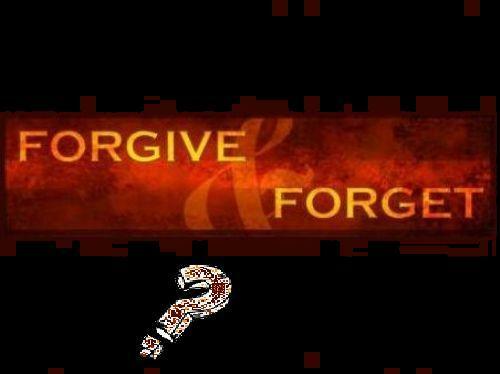 Forgive, and you will be forgiven......."
Religion made me feel guilty about forgiveness. I thought that I was a poor excuse for a christian for wanting revenge on someone that I despised. I tried as hard as I could, and I could not forgive... religion had yet again given me another reason for feeling like a failure, and not to forget the knowledge I had that I surely was going to hell, because I could not forgive. I know that each person reading this must have at least one person, past or present, that they choose not to forgive. Maybe it's a disinterested and/or dead-beat parent, a cruel parent, cruel siblings, a childhood bully who tormented you, teen-aged angst caused by thoughtless fellow students, a mean teacher who only catered to the gifted students, a sweetheart who dumped you without remorse, an ex-spouse who treated you shabbily, a co-worker who spread lies about you or a mean-spirited boss who undermined you at every turn. The list goes on and on. And we haven't even touched on church "friends", neighbors or extended families! My feelings about forgiveness reared its head last week, after a long time of being dormant. A favorite cousin of mine called and asked me if I'd like to attend his Mother's 85th Birthday party. I happened to be staying at my oldest Daughter's house for a week, when he called... so I didn't go. I wouldn't have gone anyway, I haven't seen this woman ( my Aunt ) in a long time. I have to do a juggling act, relationship wise, with my two cousins, so as to not tell them that I hate their Mother. Just because someone reaches the age of 85, doesn't automatically mean that they have evolved into a sweet and loving person after decades of being vicious. The object of my un-forgiveness is my Aunt F. ( I'll call her) who married my mother's brother back in the 1940's, and our family was never the same since. "Failure to forgive can be just as righteous, just as honorable, as forgiveness itself. "This arrogant, smug and jealous woman was unbelievably and deliberately mean and cruel to all of the females in our family. It started with my Grandmother ( her Mother-In-Law) and went all the way down to my two daughters. I couldn't count the times I came upon my mother, crying, over the mean-spirited doings of Aunt F.
No one ever told my Uncle... keeping peace in the family, you know. Besides, he never would have believed it, she is such a cunning actress. There's a lot of information out there about forgiveness, and how "healthy" it is to forgive -- it "un-clinches" the stomach and all. I only partially agree with all I've read. I know that I've forgiven my childhood peers, because kids will be kids, and I trust that they have grown up by now. However, forgiving my Aunt who's bad behavior that was bent on destruction is out of the question. I feel that it is totally unrealistic and actually inhumane to demand that we forgive. And it is so typical of biblegod to dismiss the validity of "his children's" pain when they have been trod upon. We are all individuals, not cut from the same piece of cloth... but then, the bible never has allowed individualism, has it? What is a trivial hurt to one person can be devastating to another. How many christians wrestle with the forgiveness issue, knowing THEY MUST forgive, or they themselves will not be forgiven? In real life, forgiveness should be an option... decided upon by the wounded person, because only they and they alone have contemplated the situation with all its facets. Who is ANYONE to step in and override that? Several months ago I was in my allergist's office reading old Reader's Digests and came upon a little article about forgiveness that I tore out ( I'm bad that way). Anyway, after much turning the house upside down today, I found it... It sure is a different slant, I Love It ! "A long-standing grudge suggests that we hold certain standards, that we respect ourselves enough to reject bad behavior. Failure to forgive can be just as righteous, just as honorable, as forgiveness itself." Being a Free Thinker has freed me up on so many issues, and being able to drop my fear of hell just because I will not forgive, is one of my biggest triumphs. ExChristian.Net: Is it REALLY necessary to forgive someone ?